Some millennials might be spurring a comeback of Western civilization at one of the nation’s premier universities. Stanford University students will vote April 7 and 8 on whether to reinstate a two-quarter Western civilization requirement after the success of a campus-wide campaign. 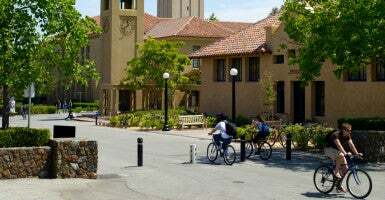 In accordance with Stanford’s commitment to educating its students, and in recognition of the unique role Western culture has had in shaping our political, economic, and social institutions, Stanford University should mandate that freshmen complete a two-quarter Western civilization requirement covering the politics, history, philosophy, and culture of the Western world. After gaining over 370 signatures, it qualified to be featured in the Associated Students of Stanford University elections ballot. Two campus discussion events about the initiative, including one led by university faculty and students, were held on campus earlier this month. “I was lucky enough to be selected for Structured Liberal Education, a year-long residential humanities program teaching the Western canon; I think all students should be afforded that opportunity,” Elliott, an economics major, said. Even if a vote is successful, the initiative would still require faculty approval. “We hope to get a positive vote to push the Faculty Senate to discuss seriously the need for a civilization requirement, and the reasons the student body want that requirement to be focused around the West,” Elliott said. “We don’t need to learn about Western civilization and its ideals, because we have spent every moment of our lives resisting and fighting to live and love ourselves, so that we can transcend Western values,” Loy wrote. A Stanford Review editorial claims that a “common civilization requirement” is essential for students if they wish to understand the society in which they live. Social awareness arises from a common set of values and norms. Societies neither function nor prosper without shared beliefs, values, or customs. Even if one disagrees with these principles and traditions, reform cannot occur without understanding the historical context in which they arose.